Presbyterian Women (PW) is a church-wide organization that is open to all women who choose to participate or be supportive of PW in any way. PW exists to build fellowship, study, raise issues and concerns to and from PW in the Mid-Kentucky Presbytery. 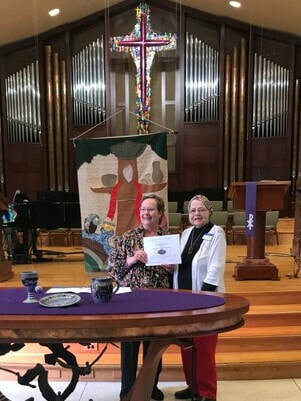 Congratulations to Beulah's Mary Hockenberry (right) who was recognized as the recipient of the 2019 Honorary Life Membership Award at the Mid-Kentucky PW Spring Gathering on March 23, 2019 at Harvey Browne Presbyterian Church. PW circles are small groups of women who gather regularly to provide an inclusive, caring community who participate in Bible study and prayer. Beulah has two circles that meet monthly from September through May. Esther Circle meets the first Tuesday of the month in the Church Library at 7:00 p.m.
Deborah Circle meets the second Thursday of the month in the Fireside Room at 11:30 a.m. The circles provide meals for our Beulah Church families during challenging times. They also support many other groups and organizations through our Benevolent Giving and mission projects. This year's Horizons Bible Study is "God's Promise: I Am With You". In nine lessons, author Amy Poling Sutherlun takes readers on a journey through scriptures to consider circumstances in which God articulated God's promise of presence. All women at Beulah and friends of the church are invited and encouraged to become a circle member. For additional information, please contact the church office at 502-239-3231.